“We have developed several algorithms for electric motor control that reduce energy consumption by 10–40%, while simultaneously improving motor performance,” explains ACK president, Dr Neil Singer. “Our technology also enables motors to run cooler, and therefore last longer.” The energy savings are in addition to those normally achieved by using VSDs. Dr Singer says that AC Kinetics is already in talks with VSD manufacturers about testing and possibly adopting the new technology. He predicts that the first drives implementing the new algorithms could go on sale before the end of 2013. The algorithms run in real time on standard drive hardware, and can replace the control algorithms on most existing AC drives. The initial version of the software needs to be able to measure the motor current, which may limit its implementation on some drives. According to Singer (above), the ACK software does not need a lot of memory or computing power to operate. “We did a lot of work to get it to work with existing microcontrollers,” he says. For example, it will run on TI’s Piccolo devices that are used widely in motor controls. ACK is not revealing precisely how its architecture works, but says that it has been designed “from the ground up to realise rapid dynamic performance, while minimising losses in the motor”. The technology integrates real-world, non-linear motor phenomena, including core losses, non-linear inductances, and saturation, in the motor and inverter. By optimising a motor’s non-linear dynamics, ACK says it maximises energy savings, while improving both transient performance and disturbance rejection. Compared to standard AC drives, the technology uses up to 50% less energy during transients and 10% less energy in the steady state, while tracking references more precisely and rejecting disturbances. The software controls the motor to generate torque on demand in the most efficient manner possible. It configures itself automatically to a motor and its application and is said to achieve a level of performance and energy efficiency “unreachable even by hand-tuning existing drives with costly instrumentation”. Energy consumption is said to be minimised for the same work output at all operating points, while dynamic performance is increased. According to ACK, conventional drives waste a significant amount of energy as heat. The new software avoids this by providing an optimal input to a motor at all times. “Our technique sips energy when it needs it,” Singer explains. As a result, the motor operates at a lower temperature and should last longer. Singer reports that during ACK’s in-house tests, when it compared its technology with three standard off-the-shelf AC drives, it found that motors operated using its own technology ran with a casing temperature of about 80°F (27°C), while those controlled by the standard drives were running at 110–120°F (43–49°C). He adds that the tests took a long time to complete because “the others would reach a stable (higher) temperature very quickly – ours took much longer”. Singer explains that one reason that one reason that his company has been able to improve on the performance of standard drives is that the autotuning functions implemented on most drives are conservative. “The motor must not stall under any circumstances,” he says. For example, in pump applications, if there is debris in the pump that increases the load on the motor, it must continue to run. “Our technology automatically delivers the overall best efficiency and power possible at all operating points,” says Singer. AC Kinetics says that its claims have been corroborated by third-party testing. In efficiency tests performed last year at MIT’s Laboratory for Manufacturing and Productivity (LMP), a hardware implementation of the ACK controller was compared with some of the world’s leading AC drives. The AC Kinetics technology is said to have outperformed the other drives, while using significantly less energy. Dr Singer says that AC Kinetics is looking at applying its technology to other types of motor. “Any type of motor that is hard to control – switched reluctance drives, for example – we could control,” Singer reports. As well as industrial applications, ACK believes that its technology could help to extend the ranges of electric vehicles, by operating them more efficiently. 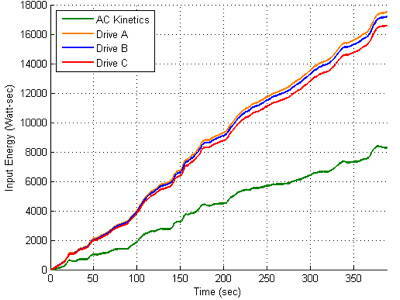 It says that in tests based on the US Environmental Protection Agency's standard urban traffic cycle, motors controlled by its algorithms used half the energy of conventional drive systems (shown in the graph above). 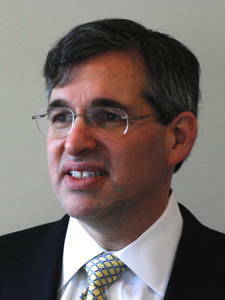 “The biggest benefit comes when you change speed more often,” Dr Singer reports. AC Kinetics does not have a fixed model for how it will licence its technology to drives-makers. “We’re open to suggestions,” says Singer. Licences may be sold on an exclusive or non-exclusive basis, and VSD manufacturers may or may not pay a royalty on each drive they sell incorporating the new algorithms. But Singer is confident that any extra costs to drives-users would be paid back within weeks or months through the added energy savings. At the moment, AC Kinetics is relying on its own trade secrets rather than patents to protect its technology, although Singer reports that the company is “evaluating” the patent situation. AC Kinetics was formed at the end of 2012, but the key members of the team behind the company have been working together since they met at MIT in the 1980s. In the 1990s, they invented and commercialised algorithms – based on Dr Singer’s PhD project – for reducing vibrations, improving settling times and cutting noise levels in motorised machines. These algorithms are now in use in hundreds of millions machines worldwide, from computer hard drives to cranes. The team has also developed an algorithm for controlling parallel motor gantry machines. This technology has been licenced to Danaher’s Dover Motion division. 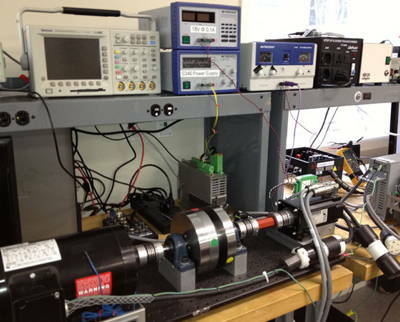 They have been working on the motor control algorithms for the past five years. “Now, we’re ready to commercialise,” says Singer.